AFC Fylde boss Dave Challinor hopes to see two faces return to training today ahead of Saturday’s game against Chesterfield. Luke Burke and Tom Brewitt should be back to boost the Coasters as they switch attention back to their National League promotion hopes after beating Ramsbottom United in their FA Trophy replay on Tuesday. With a busy run of fixtures between now and the end of the season, one thing the Coasters do not need is an extensive injury list. 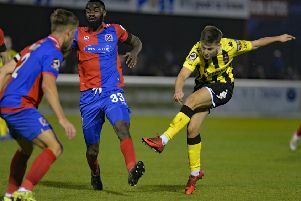 “We aren’t too bad,” Challinor said when discussing the club’s present injury situation going into Saturday’s match and then Tuesday’s game with Havant and Waterlooville. “Burky has done some functional stuff; hopefully he will be back in training. “Tom Brewitt, similarly, will do some stuff on Thursday so apart from Lewis (Montrose) we’re in decent shape. “Timi’s (Odusina) hamstring tightened up a little bit and we’re hoping that nothing’s pulled or it’s nothing major. “We have to make sure his recovery is done right to allow him to play Saturday, Tuesday. “Left-back is one position where we don’t have cover in terms of someone who can play there naturally. “We can put a right-sided full-back there so we have to make sure that bodies are fit, bodies are ready to go and we cover every eventuality. Fylde booked an FA Trophy quarter-final tie with Barnet after eventually beating Ramsbottom 4-1 at Mill Farm on Tuesday. Despite falling behind in the first half, the Coasters eventually claimed victory thanks to Danny Rowe’s double as well as further goals from Jordan Tunnicliffe and Serhat Tasdemir. Having survived a scare before progressing, Challinor paid tribute to Tuesday night’s opponents. He admitted after the game: “I’ve said it previously in the rounds when we’ve played lower league opposition, it’s never easy when you’re a favourite going into a game and you have nothing to gain and everything to lose because you’re expected to win. “Tonight is about them doing themselves justice, doing themselves proud. “They gave us a scare going in front but the two goals just before half-time changed the game.